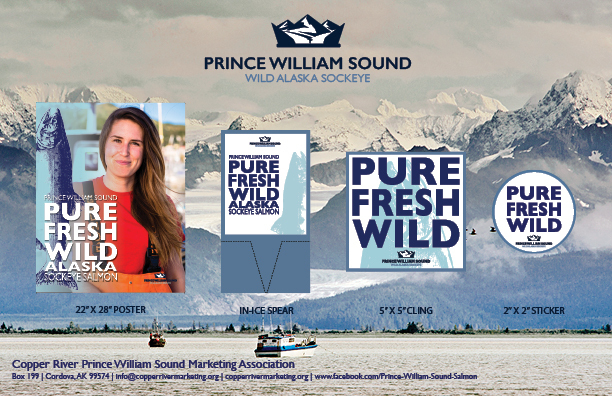 We are the Copper River Prince William Sound Marketing Association, a regional seafood development association. As a marketing association, we do not sell wild Alaskan Copper River or Prince William Sound salmon. We are a fishermen funded non-profit and work on behalf of 560 drift and set gill net fishermen in South Central Alaska. Telling the story of wild salmon from wild places and the men and women who harvest them is our primary function. We support all exclusive Copper River and Prince William Sound salmon promotions through direct partnerships. We provide retail and food service point of sale materials including custom and cobranded recipes, branding and promotional support, high resolution photography, video, and collaborative social media opportunities. Available point of sale materials include: iron man posters, vinyl clings, in-ice signs, on-pack stickers, branded stickers and labels, recipe cards, vinyl banners, branded promotional gear (hats, shirts, vinyl aprons). Don’t see what you’re looking for? Shoot us an email. Most point of sale can be co-branded and customized. Lead times vary and placing orders prior to April 1st is necessary in most cases. Access to our digital library requires a signed user agreement.